Since its release a couple of weeks ago, Leonard Cohen’s latest album has been getting a lot of attention. 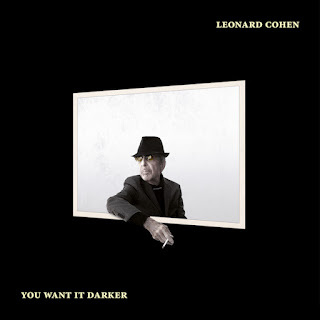 You Want It Darker (Columbia) is Cohen’s 14th studio album. But rather than write an essay with syrupy accolades and explanatory impressions of the record, I’d rather not compete with the beautiful superlatives of Sylvie Simmons in the November issue of MOJO magazine. Nor try to unfurl the historical and spiritual connection of Cohen to Montreal, his birthplace, as Robert Everett-Green did so nicely in The Globe and Mail on October 22. Similarly, I have no notion of adding anything more to David Remnick’s excellent profile in the October 17 issue of The New Yorker since I didn’t request an interview in the first place. I want to discuss Cohen’s remarkable timing with this record and the context, at least to me, of his profound ability of holding up a mirror to our world. 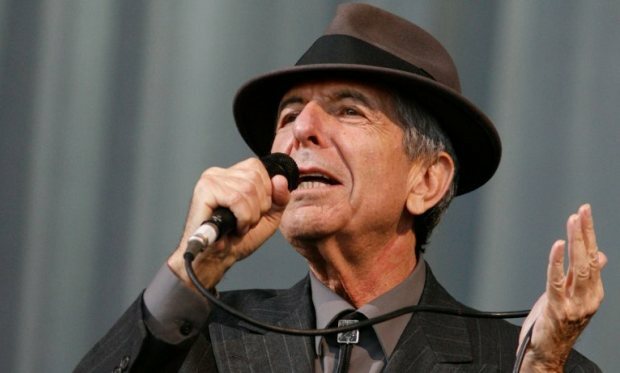 With the clusterf#%& of the Presidential election campaign to the south, the Syrian Refugee crisis and, as recently reported by the WWF, a shrinking wildlife, Cohen’s poetry and songs are like a cold slap in the face to me. A shake-up of my ego and the ridiculous speed at which the world is cruising along without taking notice of the damage humanity is incurring upon itself. Of course we want it darker and we need a poet, perhaps this poet, to point it out. Finger-wagging won’t do; we’ll tune out. But as emotionally instructive opinion surrounded by the company of music, Cohen hits the proverbial spot as only he can, and for that I’m grateful. The title track has helped me put all of the doom & gloom of the daily news into perspective and to somehow find hope, peace and resolution in all the tragedy. Cohen offers all of this help in nine songs in less than 45 minutes (the length of a typical therapy session). I dare any CNN or CBC pundit to do better. What did that famous image recently say on the Internet? : “Records: cheaper than a psychiatrist.” Well here’s an album you can listen to on the couch. It will cure your anxiety with the sage-like quality of a great poet. Only an artist who’s carefully examined his life this much could offer no less. At 82 years of age Cohen is less a preacher and more like a wise old man. In the New Yorker article, he was asked about his time in the Zen monastery at Mount Baldy where he stayed from 1993 to 1999. One of the many things he learned was that the rigorous lifestyle at the monastery may not have had a spiritual impact, but as he says, “it makes you endure, and it makes whining the least appropriate response to suffering.” Like many of his recent albums, Cohen’s new record is a contemplation of his place in the world and how to prepare for the next. On “You Want It Darker,” he declares, “I’m ready My Lord.” (I don’t know if I’m ready but I’m willing to prepare.) Cohen’s words are hopeful on “Treaty,” graced by a string ensemble that’s almost pastoral in its sound and feel. “Leaving The Table” with its country-flavoured sadness that has a Guy Clark sentimentalism about it, makes for an effective statement about Cohen’s present condition. “I’m leaving the table. I’m out of the game,” he sings with great honesty. “Traveling Light” offers up another lament for moving on from a broken relationship, presented as a Mediterranean folk song complete with backing vocals. This time it’s personal and Cohen’s openness grants the listener permission to be as open and consequently as dark on the subject as he is. What we get from Cohen, as we have in all of his work, is a man searching and often finding the courage to “become who he is,” to paraphrase Carl Jung. It’s a complicated process full of pain, regret, guilt and shame. 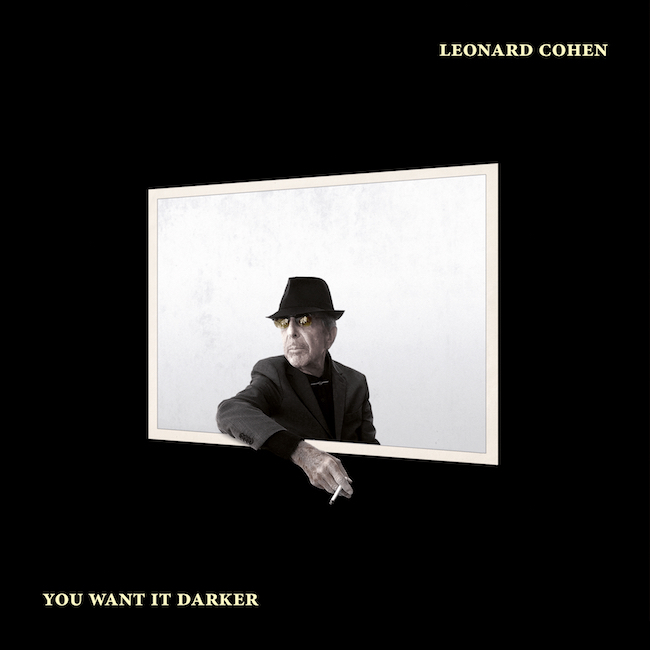 Thankfully this album concludes with the mea culpa of “Steer Your Way,” as Cohen advises us to “steer your way… year by year, month by month, day by day, thought by thought.” Thanks, Leonard, for some insightful and poetic advice. I feel better already. – John Corcelli is a music critic, broadcast/producer, and musician. He is the author of Frank Zappa FAQ: All That’s Left to Know About the Father of Invention (Backbeat Books, 2016) now available.